Product Introduction Pure BLACK Sofguard | Threehills CO., LTD.
Sofguard is recommended for use to people who suffer from menstrual pain and excessive sensitivity to cold. We deal in both boxer-type and short-type products. Let yourself be wrapped up in our characteristic far infrared rays!! The characteristic far infrared rays of our original new fabric "Pure BLACK" resonate with natural wavelengths of human body to keep you amazingly warm. 81% of the testees in the monitoring test are reported to have been satisfied with Sofguard. Sofguard relived me from severe menstrual pain. Sofguard is comfortable to wear. Sofguard freed me from obstinate constipation. Even in winter, Sofguard helps me to wake up feeling fresh in the morning. 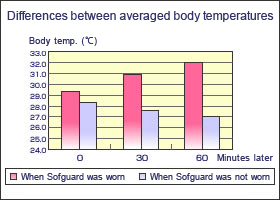 If I wear Sofguard, I, clad in a skirt, feels almost no cold even in winter. If I wear Sofguard, I feel I can be more concentrated than usual. Effect of elevated body temperature brought about by the wearing of the shorts (Sofguard) emitting characteristic far infrared rays. 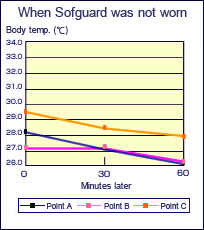 To measure the differences of rise in body temperature between when Sofguard is worn and when it is not worn. 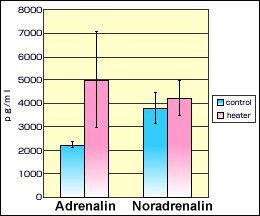 Measurements by thermography were conducted every 30 minutes in a 18.5 degrees C room. 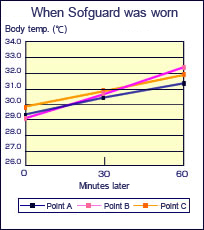 The graph shows averaged body temperatures at fixed points when Testees 1 and 2 wore Sofguard and did not. The graph shows averaged values of different body temperatures at fixed points when Testees 1 and 2 wore Sofguard and did not.